ATTENTION Job Seekers: Looking for Interview Questions and Answers? ...and knock the socks off ANY hiring manager. Imagine walking into your next job interview feeling confident that you have impressive answers to any question the hiring manager may ask. You have none of the usual butterflies, no sweat on your brow. No hyperventilating this time - you are relaxed and ready! Imagine being so well prepared that you win over the hiring manager with small talk before the interview even begins. Before you know it they are smiling, you are smiling, and you both feel relaxed. You nail all the things your interviewer is looking for. With your perfect interview answers, you quickly set yourself apart from competing job seekers. As the interview wraps up, the interviewer is noticeably impressed - and you even have a few intelligent questions of your own. On the drive home you have none of that second guessing, no embarrassment over flubbed answers - no regrets about the interview. You know you aced it. The next day, you get a call offering you the job at a higher salary than you expected because you knew exactly how to answer the dreaded salary questions. You celebrate that evening with friends and family and look forward to your exciting new position. If you are like most of us, you have experienced "the less than perfect" interview at least once. But, with the right preparation, customized phrases, and perfect answers from the #1 Interview Coach, you can put those days behind you for once and for all. No more tripping over your words and getting it all wrong. Never get off on the wrong foot again. Don't let nerves rob you of your full confidence. Stop sounding less impressive than you actually are. No more fear of questions you don't know how to answer. Never again give answers she's already heard 100 times. It can be tough to try and second guess what the hiring manager is really looking for. The job descriptions are full of impressive 'MBA-speak' but they don't always tell you what is really going on in the interviewers head. That is why you need help from someone who has been on the other side of the hiring desk - someone who has not only hired, but who has actually trained hiring managers on how to conduct hiring interviews. Hi! 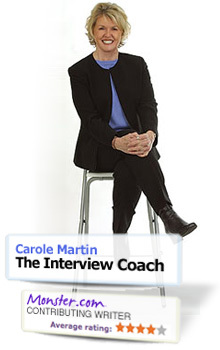 I'm Carole Martin, The Interview Coach. Now, anyone who knows me will tell you that I do not like to toot my own horn. What I do like - a lot - is helping talented, hard working people show up at interviews so well prepared that they stand out from the competition, make a memorable impression on the hiring manager and get the job. As a former hiring manager, I have truly seen and heard it all. I've not only conducted 100's and 100's of interviews myself, but I have designed the strategy and training for all the other hiring managers to follow. So, without tooting to loudly, I know what you are facing, and I know how to get you ready for any Interview Question that may come your way - and that is my passion. In fact, I was so passionate about helping people like you succeed, I left my amazing corporate HR job so that I could start my own business helping people prepare for the most important job interviews of their lives - I even went back to school for a masters degree in Career Development. Since then I have authored 4 books on hiring and interviewing, have articles all over the web and I am still involved with Moster.com as a contributing writer. More importantly, I have personally coached thousands of people to successfully land their dream job. Now, I want to help you land your dream job. with the Perfect Answers to Any Interview Question. so that You Can Land Your Dream Job, too. Imagine how it would be to have me sitting on your shoulder whispering in your ear during your next interview. Okay, not literally. But, imagine how relaxed and confident you would feel knowing that you were ready with impressive, intelligent, fun answers to every question the hiring manager could ask. Skillfully put a positive spin on all those potential negative questions. Talk about your weaknesses, while coming across stronger than ever. Know exactly how to make it personal and fun, without crossing the line. Build rapport with my perfect phrases for small talk before the interview. Finally know how to easily handle the dreaded Salary Question. Learn winning tricks that make your answers really stand out from the crowd. you'll be kicking yourself later. With unemployment at its highest rate in years and fierce competition for even undesirable positions, you need to go beyond the "extra mile" that used to win jobs a few years ago. You need your interview answers to be razor sharp, and to give you a real competitive edge. Which is why you're reading this right now, isn't it? You don't want to be the person tripping over their words, saying the wrong thing, and blowing the opportunity to get your career back on track. You know your interviewer will have some tough questions up their sleeve, and you want to know how to deliver the right answers and set yourself apart from the crowd. Why do you think you are qualified for this job? Can you give me an example of a time when you ...? How do you get others to buy into your goals and objectives? ...and many more tough questions you have not even thought of yet. Instead of walking into your next interview feeling like a nervous wreck and having your mind go blank with fear when you get asked a "make or break" question, be totally prepared so you can feel cool and confident and answer even the most off the wall questions like a pro. As the #1 Interview Coach, I have had clients pay me $1000's of dollars to help them land their dream job. Even my smaller package of two private one-on-one coaching sessions with me can cost up to $597. instant access to the same great information at a fraction of the cost. after they landed the job of their dreams! "Not only did I find a position, but it is looking like this may be the best fit I could have had in my working career." "Thank you so much for all the expert help you have given me to make it possible for me to reach my goal. Not only did I find a position, but it is looking like this may be the best fit I could have had in my working career. I am so happy and contented in my work and so thankful to you for the help you have given me to get here. Thank you for all your expert advise and help." "Not even 45 minutes later I was offered the position!" "I interviewed with the head of Human Resources and then with the CEO. When the money issue came up, I followed your advice. Not even 45 minutes later the Head of Human Resources phoned me and stated that they are offering me the position for the VP of sales." "This job is going to make me so happy and content, it's unbelievable." I can't thank you personally enough. This job is going to make me so happy and content, it's unbelievable. I am impressed that we're around the same age, and like you said, it's never too late to change and better yourself, so to speak. Thanks for making me feel the same way." "Thank you for your help. I got the job! " All of my worrying about what to say for the weakness question was in vain. Thanks again for your help. I used a lot of the tips from your book. What sets these job winners apart from most struggling job seekers? There's more to a great interview than the questions and answers portion of the interview! In fact, I've seen interviews go south before a single interview question was even asked. And, what most job applicants don't realize is that, having answers to these questions is not enough. There are hidden questions, judgments based on appearances, surprises, unspoken information that speaks volumes about you. My ebook will show you how to use body language, small talk,and certain 'special' trigger phrases, to ace EVERY aspect of the interview...and not just the questions. This is why my eBook goes beyond just giving you perfect answers to the tough questions. In my "Interview Questions and Answers Guide," you will also find specific, easy to learn tips on handling more than just the questions. 6 ways to turn 'Small Talk' into "power talk" - and into another opportunity to land the job - before the interview even begins. 7 ways to spice up boring phrases the interviewer has probably heard a 100 times already...and make your answer the most memorable they've hear yet! The 10 most common Interview Mistakes... mistakes that the candidate who gets the job won't make. The 4 red flags on your resume every interviewer will always ask about - and how to smooth them over...and even turn them into a plus. The Secret Answers every Interviewer expects to hear from the 'ideal applicant'... but won't ask directly. 5 ways to customize your answers to the specific job, company and industry...So you can sound like you already have to job. ...that the Hiring Manager Will Never Ask? As an interviewer, I had three critical questions on my mind in every interview - that I never asked out loud. That's right. These are questions that have to be answered in order to find the right candidate, but they are not questions you will actually hear out loud! So how are you supposed to make sure you 'give the right answers' to questions that they don't ask you? And I am not alone. I trained hiring managers too look for answers to these questions in applicants behavior, body language, clothing, and off hand comments and small talk. It is usually safe to assume that you would not be given an interview unless they thought you were likely to be qualified for the job. So, even though they will ask you about your qualifications again, it is these unasked questions - the answers to which they can only get by meeting you face to face - that are actually some of the most important questions in the whole interview. ...before you even open your mouth? You are reading this now because you know how important it is to prepare great answers to interview questions. And it is true, what you say in an interview can make or break you. But, while you are carefully planning and rehearsing what you will say with your voice, are you considering what you are saying with your clothes, your body language, your smile, and the other non-verbal clues that interviewers are trained to pick up on? Do you arrive in a flurry of noise, disorientation or are you calm and happy? Where do you sit in the waiting room? How do you sit? How do you treat the receptionist? Are you friendly, abrupt, shy? How do you enter the hiring manager's office? Do you walk with confidence? How is your greeting? Handshake? Smile? Do you make eye contact? Do you fumble for a resume? Does it look nice - or like you used it for a place mat at breakfast? As we make small talk, what do you reveal about your true personality? Hiring Managers Call it... a "head start!" Do you put as much thought and preparation into answering the question, "How was your past summer?" as you put into talking about your past achievements? Interviewers are 'on task' the moment you open your mouth. They might ask friendly questions to break the ice as you sit down - they might ask if you had any trouble finding your way to the office building that day. Seamlessly weave important information into your small talk. Use casual conversation to build trust, rapport and start on the right foot. Start 'branding' yourself as the ideal candidate starting with the very first words that come out of your mouth. about you as your verbal answers? Have you looked in a mirror lately? Have you tried video taping yourself answering a few questions? Do you know if your body language is contradicting or supporting your carefully planned and rehearsed verbal answers? You may be saying that you are a confident, high energy person, but if you are slouching - even just a little - your body is telling the hiring manager, "it isn't really true! " Learn the right body language to put the interviewer at ease and support your answers. are as Important as the Questions They Ask You? Imagine this: Your interview couldn't have gone better. You gave intelligent, memorable answers that positioned you as the best candidate for the job. Then, as the interview wraps up, the interviewer asks you if you have any questions! What? You were so focused on the answers you prepared, you did not even think about what you should be asking them! You sit with your mouth half open - your mind blank. With horror, you realize that the last impression they will have of you is this one of a speechless, unintelligent stare. In my eBook, I will give you specific questions so that the last impression you leave is as good as the rest of your interview. You'll discover the questions that are appropriate to ask - the things that the interviewer expects you to ask - the questions that prove that you have been listening and you are already as actively engaged as you will be when they hire you. Did you know that resumes are often never even read by people. Instead, they are electronically scanned for key words and phrases that represent things the employer is looking for. Then, resumes that pass this initial test are reviewed more closely by an actual hiring manager and candidates are invited for an interview. The interview process is actually very similar to the initial electronic scans done on the resumes. Interviewers are taught to watch for the key traits and skills the employer is looking for, and just like a search engine they "scan" the conversation you have with them for key words and phrases that represent the things they're looking for. Candidates who include the words and phrases the interviewer is looking for in their answers inevitably become the top choice and win the job. And this is exactly what I teach my clients: proven phrases to include in their interview answers that would show the interviewer they matched all the criteria the employer was looking for. "I took a couple of wrong turns, but I don't ever let mistakes throw me. I just turned around and went back. Luckily I had allowed extra time, so I was not upset when I got lost. Eventually I figured it out and arrived with plenty of time." Can you spot the job winning phrases? "I don't ever let mistakes throw me"
...show the interviewer that you stay calm and cool under pressure, that you are persistent in tackling problems, and you get the job done even in the face of challenges. You can insert phrases like this in all your answers to repeatedly illustrate to the interviewer that you possess the traits they're looking for. Pepper them in enough times, and you'll quickly become a "must hire" candidate they're willing to do anything to hire! Now, you'll never be stumped by a tough interview question. Or have to feel worried and anxious that you'll have a curve ball thrown at you and not be prepared to give a good answer. Because I've taken all the most common interview questions (including the ones job seekers struggle with the most) and put them into an easy to follow winning interview answers guide. Inside, I reveal the exact winning words and phrases you should use in your answers to each interview question - so you can quickly and easily prepare top notch answers to those tough questions you've been worried about. These winning answers will set you apart from competing job seekers, and show the interviewer you are the right person for the job. They will trigger the hiring manager's "hiring reflex" as you use them to nail one qualifying criteria after another! And you'll finally be able to escape the monotony and frustration of the job hunt and get into the job you deserve. "I Am glad to inform you that I got the job"
Am glad to inform you that I got the job. Thank you so much for your efforts and for all the lessons. I shared those lessons with my sister and we have both been retained by our organization. The restructuring exercise has left 246 employees jobless. Thanks so much, without your help I would’t have achieved this. I am going to tell people more about you. "I recently paid $750 for other coaching from someone else, but felt that I gained more in just a few minutes from you"
I think your website is awesome! You recently coached and helped to prepare me for an interview. Which by the way you were like a good friend. Listened and got right to the point. I recently paid $750 for other coaching from someone else, but felt that I gained more in just a few minutes from you. You have a warm, wonderful personality!!! I truly appreciate and would highly recommend your service. "I got the job the next day. " I have been reading with interest the emails you have been sending and have picked up some superb tips. I just thought you might like to know that I have just got myself a new job after being made redundant at 55!! "In the end I beat out 8 people and I feel great. Thanks to YOU! " I did download the" book". The information was great. I really think it separated me from the others. I was so prepared. The most important part of the information was how to answer " tell me about yourself". It's the first question, if you feel you sounded stupid it throws you off the rest of the time. In the end I beat out 8 people and I feel great. Thanks to YOU!!! Carole, I am forever grateful. I go to New Jersey on July 21 for training, I am soo pleased I could bust. Inside the "Interview Coach's Interview Questions & Answers Guide," you'll be taken step-by-step through all the important interview questions you'll face in your next interview and discover how to quickly craft the perfect answers for your situation, background, and the position you're applying for. This is not just a manual of "cookie cutter" interview questions and answers. Instead, you'll get dozens of answers that have been proven to "Wow!" even the most hard nosed interviewers - and then you'll be walked through how to tweak and tailor those answers to fit you. Because there is only one person with your unique history, and your answers need to reflect that if you want to really stand out from the crowd. The 10 most important questions every interviewer will ask and how to answer them. Forget to prepare for even one of these and you're chances of walking away jobless are much higher. Three 'hidden' questions in the mind of the interviewer that they will NEVER ask out loud, but that they will answer for themselves by the end of the interview based on your interaction with them. I'll show you how you can gain a winning edge by answering these "unasked" questions during the interview. 12 Great ways to answer the dreaded Salary Question. How do you answer without boxing yourself in or selling yourself short? Find out how to make sure not to price yourself out of a job. Five ways to use the job posting, the application and the interviewers own words to customize your answers on the spot. The questions YOU should ask (you know, that awkward moment at the end of the interview when they ask you if you have any questions? YOU SHOULD... these tell the interviewer a lot about you, and I'll reveal what questions will tell them the right things). How to open and close the interview: what small talk and parting words will create positive impressions. 10 most common 'bloopers' in answering interview questions and how you can avoid them (and the embarrassment). Everyone has at least a couple questions they dread hearing in an interview. Maybe you got fired from your last job or have been unemployed for an extended period of time. Or maybe you have some other bad experience in your past that you don't want to lie about (but are afraid will make you look bad). Even worse are the questions you haven't thought about at all. The ones that will pop out of nowhere and leave you confused and unsure of what to say. Inside the "Interview Questions and Answers Guide" you'll learn how to formulate answers for all of these tough questions. So you can walk into the interview with total peace of mind and full confidence that you can sell your skills and experience and win the job. Behavioral Questions like, "Tell me about a time when you..."
Past experiences: how you can be honest about your past and still win the job. Strengths and weaknesses: how to connect with the things your prospective employer is looking for and show them you have the skills and experience to do the job. What makes you unique: how to stand out for highly competitive positions. Getting fired: the key things you need to find out before answering questions about being fired. Lacking experience: how to bring other skills into focus to make up for holes in particular areas. Salary: how to handle salary questions so you don't close off a chance at a higher salary. On top of the proven interview answers and phrases for all the toughest interview questions... you'll also get numerous confidence building, answer sharpening interview preparation exercises. Pin point the exact phrases the specific employer you are applying to will be focused on the most, so you can emphasize them more throughout your interview and easily win the favor of the interviewer. Prepare for answering follow-up questions like a pro. While you can memorize key interview answers, you also need to know how to improvise. I'll give you inside tips and secrets that will have you answering even the most "off the wall" questions like a pro! Laser in on the key phrases for the position you are applying for so you stand out as the top candidate for that particular position. hundreds of dollars to learn from me in the past. Now, I am making them available to you online for a fraction of the cost. "I was floundering, ready to expand and reach out to new career possibilities but really did not have any direction until I met Carole Martin. Not only is Carole a beautiful and caring individual but she is truly a Guru!" Since we both live in the San Francisco Bay Area, I really feel privileged to have been able meet with her one-on-one and learn directly from her deep knowledge and insight. And I am sure that no matter where your location is on the globe, Carole and her solid process will be able to help you truly identify your professional strengths, be able to communicate them well so you will win those contracts or stand out as a stellar candidate. If you are ready to make a change or if you need to improve your hiring processes, please read Carole's books. I assure you it will make a difference." "Your interview coaching download was the best money I have spent on my career." Your interview coaching download was the best money I have spent on my career. Interviewing was always my problem and now I feel I have it under control. So many times I would make it from the top 50 to the top 3 and never make it to the chosen one. I am now interviewing again due to a company re-organization and am confident on my interviewing skills. "I've aced my interview because I followed Ms. Martin's advice." I've been through many interviews. This workbook hits all of the important points, reviews the obvious and gives new tips and ideas to help get the job. I've aced my interview because I followed Ms. Martin's advice. I like her real life scenarios and humor. I highly recommend the book. "I got more money, more vacation, better benefits, more job security...life is good." I just wanted to drop you a line and say thanks ....I got the job! I got more $, more vacation, better benefits, more job security...life is good. Thanks, and you can be sure that I will recommend your product to all my friends and family. Interview Questions and Answers Guide"
Dozens of questions and examples of winning answers that you can use to model your own answers after. Pre-interview preparation exercises and mindset training: You'll get some of the same proven interview preparation exercises I give to my one-on-one coaching clients. These will allow you to uncover custom interview answers that will be authentic and natural - as well as effective at standing out and winning the favor of even the toughest interviewers. The "Bad," the "Boring" and the "embarrassing... Examples of bad interview answers and tips for how they can be improved so you can sharpen up your own answers. Detailed tips and tricks for each example question and answer - showing you exactly how to custom tailor your own winning answers based on your unique background, skills, and experience. The 3 questions the interviewer never asks, but will answer by the end of the interview. Questions for you to ask throughout the interview to communicate key job winning elements. The 7 Interview Question Myths explained: find out the truth so you don't let a common misconception cost you your dream job. An easy technique for dealing with those tough 'what's your weakness' questions without focusing on negative experiences or negative traits that could make you look bad. And dozens of other interviewing tips for communicating what you have to offer, making yourself stand out, and winning the job! Bonus Chapter: The 7 Hiring Myths - Carole Martin, the Interview Coach, debunks the 7 myths of hiring - don't let these common misconceptions make interviewing any harder. Bonus Chapter: Job Search Tips - Keep your spirits up even when the going gets tough - tips to make you tougher. Bonus Chapter: Q & A with the Interview Coach - get a glimpse into the Interview Coach's personalized answers to some real-life questions from job seekers just like you. You won't have to pay $1000's of dollars like my private clients paid. You won't have to pay $100's of dollars, as you would for one private phone session. ... PLUS these special bonus items for free! Do you know why I quit my great job, went back to school and started my own Interview Coaching Business? Because I knew I could help people like you and because I really want you to succeed. As an The Interview Coach, I have done a lot of speaking, writing and..of course, coaching individuals on all aspects of job search, interview preparation and negotiation. 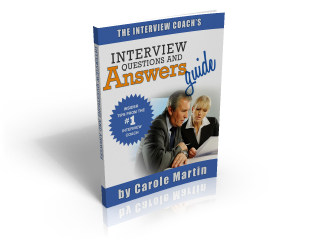 I know that my "Interview Questions and Answers Guide" will give you a big advantage over the competition all by itself. I also have put together a couple of extra bonuses just for those who try the eBook on from this offer. During this 2-hr interview, you'll hear me address a few more advanced topics from preparation advice for competitive interviews to tips about etiquette. How to mentally prepare for the interview before it starts and how to research the company before you go. The proper way to dress for your interview and etiquette for interviews that are during meals. How to avoid sounding too scripted, too desperate, too nervous, or too cocky. Listen as I reveal behind the scenes info about the job interview process on this one-hour audio download. Things you need to DO in and interview, not just things you need to say. Relaxation tips to ease pulse racing anxiety to a gentle confidence in just a few minutes. Several key indicators to tell if you're interview is on the right track, and how to save yourself if things start going sour. Tired of Getting Rejected? Sick of The "Never Ending" Grind of Hunting for Jobs? Then Get The Answers You Need to Win The Job! Look, you can keep going to interviews and guessing what the interviewer is looking for. You can keep hoping that your next interview will be the one that finally lands you the job. Or, you can get inside the minds of the toughest interviewers through my 18 years of experience as a hiring manager. And you can learn what answers will set you apart from the competition and really seal the deal on your next job. Why waste hours online surfing for interview tips when you can get all the right answers right now in the "Interview Questions and Answers Guide"? Try out the answers, words, and phrases inside "Interview Questions and Answers Guide" at your next interview. If you aren't absolutely thrilled with the results you get, if you don't think they give you a winning edge, and if you don't think they make the entire interview process so much easier... just let me know. And I’ll refund every penny of your investment on the spot. Truth is, I don’t think you’ll be asking for a refund. I think you will be thrilled with how easy this guide makes preparing for and acing your interview. But I’m going to let you be the judge of that, because I think that’s only fair. Picture the elation and excitement you'll feel when you ace this interview and launch your career onto a higher and better path. Your job has such a big impact on your life. You spend 8 or more hours a day, every day there. It controls your financial security and freedom, your lifestyle, and the things you can provide your family and children with. It is one of the biggest influencers on your happiness. Now, imagine what acing this interview and landing that dream job you have your sights on will mean in all these areas of your life. Don't walk into your next interview unprepared. Get the answers your need to succeed, and get your career on the path you deserve to be walking! To get instant access to the "Perfect Phrases for the Perfect Interview" guide, just click the test drive link below. You'll be taken to our 100% secure order page, and once your order has been submitted you'll get instant access to the downloadable manual and all the proven answers you need to ace your next interview! Here's to the next step in your career! Yes, I'm aready to land my dream job and want to make sure I have all the proven interview answers, phrases, and words that will make me stand out nd win the job! Sign me up for the risk-free test drive of "The Interview Coach's Interview Questions and Answers Guide" now! P.S. The Interview Questions and Answers I discussed in this letter will give you the winning edge you need to beat out the tough competition in today's tough market and land a job quickly. Don't be just another face in the crowd by walking into your next interview without these proven words and phrases in your answer bag! "I was very prepared for all questions that they asked me, and look…it paid off!" Without it, I would not have had the courage to speak up for what I wanted. I negotiated and requested some final salary/bonus adjustments today - which are doable! Without your help, I would not have had the courage to speak up for what I wanted. Without my scripts in front of me, I wouldn't have gotten past asking for an extra $10! Thank you again. Your encouragement and help in pulling out of me what I so conveniently suppressed really helped me see more things about myself than just how to interview more successfully. "I have interviewed thousands of people and have watched them make major mistakes and lose the job to someone else. Although I wanted to help them, I couldn't because I was on the other side of the desk. When I returned to grad school in 1993 to pursue my Master's degree, I made a decision to change what I did because I wanted to help people..."